Donald Clark Plan B: 21st Century Skills are so last century! 21st Century Skills are so last century! 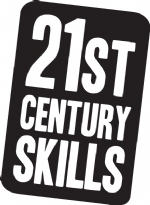 The new mantra, the next big thing, among educators who need a serious sounding phrase to rattle around in reports is ‘21st Century Skills’. I hear it often, almost always in some overlong, text-heavy, Powerpoint presentation at an educational conference, where collaboration, creativity, communication and emotional intelligence skills are in short supply. Thank god for wifi! But does this idee fixe bear scrutiny? In a nice piece of work by Stepahnie Otttenheijm, she asked (radical eh?) some youngsters what 21st C skills they thought they’d need. Not one of the usual suspects came up. They were less vague, much bolder and far more realistic. Rather than these usual suspects and abstract nouns, they wanted to know how to create and maintain a strong digital identity, be nice, recognise what’s learnt outside school, learn how to search use my Facebook privacy settings. My suspicion is that they know far more about this than we adults. Young people communicate and collaborate every few minutes – it’s an obsession. They text, MSN, BBM, Instagram, Facebook, Facebook message, Facebook chat and Skype. Note the absence of email and Twitter. Then there’s Spotify, Soundcloud, Flickr, YouTube and Bitorrent to share, tag, upload and download experiences, comments, photographs, video and media. They also collaborate closely in parties when playing games. Never have the young shared so much, so often in so many different ways. Then along comes someone who wants to teach them this so called 21st C skill, usually in a classroom, where all of this is banned. I’m always amused at this conceit, that we adults, especially in education, think we even have the skills we claim we want to teach. There is no area of human endeavour that is less collaborative than education. Teaching and lecturing are largely lone-wolf activities in classrooms. Schools, colleges and Universities share little. Educational professionals are deeply suspicious of anything produced outside of their classroom or their institution. The culture of NIH (Not Invented Here) is endemic. Again, we live in the age of abundant communication. There’s been a renaissance in writing among young people, who have become masters at smart, concise dialogue. The mobile has taken communication to new levels of sophistication. They know what channel to use, in terms of whether it’s archived or not, synchronous or asynchronous. Texts and Facebook comments are archived, some messages are not (voice and BBM). You call people, synchronously, when you want them to make a decision. Text is asynchronous, therefore slower, more relaxed. They can also handle multiple, open channels at the same time. What do we educators have to offer on this front? Whiteboards? Some groupwork round a table? Not one single teacher in the school my sons attend has an email address available for parents. I’ve just attended two major European conference where only a handful of the participants used Twitter. What do we know - really? Problem solving is a complex skill and there are serious techniques that you can learn to problem solve such as breakdown, root-cause analysis etc. I’m not at all convinced that many subject-focussed teachers and lecturers know what these generic techniques are. Problem solving for a maths teacher may be factoring equations of finding a proof but they’re the last people I’d call on to solve anything else in life. Do teachers actually know what generic problem solving is or is it seen as some skill that is acquired through osmosis when a group of kids get together to make a movie? Beware of big, abstract nouns. This one has become a cipher for almost everything and nothing. I have no problem with art and drama departments talking about creativity but why does creativity have to be injected into all education. Creative people tend to struggle somewhat at school where academic subjects and exams brand them as failures. When it comes to creativity, my own view is that the music, drama and other creative skills my own offspring have gained, have mostly been acquired outside of school. I have some sympathy with this one, as critical thinking is sometimes well taught in good schools and universities, but it needs high quality teaching and the whole curriculum and system of assessment needs to adjust to this need. However, as Arun has shown, there is evidence that in our Universities, this is not happening. Arun (2011), in a study they tracked a nationally representative sample of more than 2,000 students who entered 24 four-year colleges, showed that Universities were failing badly on the three skills they studied; critical thinking, complex reasoning and communications. This research, along with similar evidence, is laid out in their book Academically Adrift. Across the Arab world young people have collaborated on Blogs, Twitter, Facebook and Youtube to bring down entire regimes. Not one of them has been on a digital literacy course. And, in any case, who are these older teachers who know enough about digital literacy to teach these young people? And how do they teach it – through collaborative, communication on media using social media – NO. By and large this stuff is shunned in schools. We learn digital literacy by doing, largely outside of academe. To be frank, it’s not something they know much about. Beneath all this, is there just a rather old, top-down, command and control idea – that we know what’s best for them? Isn’t it just the old master-pupil model dressed up in new clothes? In this case, I suspect they know better. There’s a brazen conceit here, that educators know with certainty that these are the chosen skills for the next 100 years. Are we simply fetishising the skills of the current management class? Was there a sudden break between these skills in the last compared to this century? No. What’s changed is the need to understand the wider range of possible communication channels. This comes through mass adoption and practice, not formal school and university. It is an illusion that these skills were ever, or even can be, taught at school. Teachers have enough on their plate without being given this burden. I’ve seen no evidence that teachers have the disposition, or training, to teach these skills. In fact, in universities, I’d argue that smart, highly analytic, research-driven academics tend, in my experience, often to have low skills in these areas. , formal environment is not the answer. Pushing rounded, sophisticated, informal skills into a square, subject-defined environment is not the answer. Surely it’s our schools and universities, not young people, who need to be dragged into the 21st century. As you know I regularly read your blog and enjoy your musings, thoughts and comments whilst quite often not agreeing with you (in a healthy way) . Again you raise many interesting points (criticisms) in the post ,many of which I, and indeed many of my colleagues in the education sector agree with some of which I don't. This caused me to reflect how do we effectively change a system which , I think we both agree, is not fit for purpose . We both subscribe to "ilician"principles in respect of "de-schooling" but the failing point in the (my) argument , given that I support a fair and equitable provision of education is how and who pays ? of the current educational paradigm/system to embrace change and the challenges you highlight . "Education fit for the 21st century"
Great article, Donald. Hits the nail on the head! Agreed. Most of these skills are picked up in 'real' activities outside of school. In the case of my own children, it was 9 years of Taekwon do in a mixed age group environment with loads of teamwork and competitions. Work experience is also important. School is fine but it's banded by age and constricted by peer pressure. Formal education does not fit well with these informal skills. These are my 'who pays' views in HE. In short, we have to make education cheaper and more productive. This can't be done with the current model (buildings and teachers) hence my work in technology and learning. Scalability is the answer. "We learn digital literacy by doing, largely outside of academe. To be frank, it’s not something they know much about." If by 'digital literacy' you *actually* mean 'digital competence for using social media and other affinity spaces young people frequent' then, yes. If you mean 'digital literacy' in terms of conceptual skills, criticality and civic engagement, then no. And there's a whole *raft* of reasons (and history) behind the mis-named 'Arab Spring' that a reductio ad absurdum to social media causation completely misses out. Interesting and thought-provoking, thank you Donald. However, I think you do tend to conflate and gloss over at points. For example your first section is entitled "collaboration & sharing" but you go on to talk about sharing and almost entirely miss collaboration. A minority of young people experience the latter through MMOs, but where else do they develop this? And, although more communictaion is becoming virual, young people need to be able to engage in face-to-face collaboration. School is a good place to do this and, in my experience, it is not something young people like doing. Yes, they may want to collaborate with friends on "raids", but adult life also involves collaborating with people you don't like around activities you'd not particularly choose. I agree with the substantive point that many educators don't have skills to teach these things directly, but I do think we can create environments in which they can emerge and be developed. You suggest a narrow range of contexts in which young people practice these skills, but I think we still need to address the issues of transfer and generalisation. There's rarely an occasion when I don't do something different as a result of reading and thinking about what you write. Keep it coming! "If you mean 'digital literacy' in terms of conceptual skills, criticality and civic engagement, then no." Sort of agree with this but disagree that formal education has much to offer. Having done loads of work in education recently, I see little real skills in these subjects in schools and univs (critcial skills excepted but see work by Arun). As for 'civic engagement' it's largely absent. Mis-named Arab Spring! Easy for sit and throw latin phrases about when people have, and are, dying for their future. I've been in the Middle East a lot this year, including Syria and Egypt (will be there again in 2 weeks). This is no idle blog topic. I've written about social media in the Arab Spring before and it's not a simple causative matter. The Arab Spring (yes let's call it that) took place in the age of social media, not because of social media. Most argue that social media was a necessary condition for its success but not its sole cause, and I agree. It's complicated and characterising the debate as a reductio ad absurdum argument is trite. If you want to have a go at this then apply the logic and come to a reducio ad absurdum conclusion. There is quite a difference between 'skills' which tend to relate to a prescriptive view of curriculum and 'competencies' which relate more to an autonomous view. 21st Century Competencies would seem to me more descriptive of the dispositions students need to function successfully in a 21st world rather than a prescriptive list of skills which may or may not be necessary to the future success of the individual. Agree, my mistake, so a few comments on collaboration. In my experience, it comes in lots of forms: Multiplayer games, as you mention (outside of school) Sports - my two kids had nine years at 4/5 times a week in a sport they loved (outside of school) Music - being in a band (outside of school) etc. When I compare this with the groupwork in classrooms (which is sometimes a good thing), but often descends into lurking, distractions and disinterest, I prefer the real world collaboration. Interestingly, I have twins, one doing A-levels, the other the International Baccalaureate. The latter is much stronger on collaboration and critical skills. Of course, I agree with all this. But I do want to flag one negative issue: conformity, the insistance that nobody thinks differently. Conformity has raised its head in the ugly aspect of cyberbullying. In education, the 'nerds' (the gifted) have always been targets and rarely helped with handling it. This, alongside the unpleasant Internet practices of flaming and trolling, creates a clear need for assertiveness, debating and negotiation skills. James (darkone) A belated thanks for the title - inspired by your tweet. Interesting point about conformity. My own view is that peer pressure is encouraged by single age band schooling. This exacerbates the problems. It's also why I think more out of school. mixed age experience is necessary for young people. Donald, I don't know if you've encountered Harold Rheingold's Social Media class's mindmaps on the subject. I agree but where's the evidence that schools and teachers have the skills themselves? In my experience, there's a deep suspicion of technology in education that prevents teachers and lecturers (note the name) from even using social media, let alone teach it's use. This focus on so-called 21st C skills is a red herring. Young people need precise, practical skills (using media among them) not the over-academic curriculum they're fed. The 21st C skills agenda is yet another example of this woolly thinking. Just a word on sharing and collaboration. My experience in secondary education is that there is a great deal of sharing, far more than in the past. It happens through Twitter, forums, TES Connect, web sites and blogs. My colleagues and I are even concerned about "resources panic" because we are so bombarded with sources to work with. The hierarchical structure of English school departments also encourages team work. The same cannot be said of French secondary schools, for example, where there is no department leader. In passing, it is noteworthy that the best collaborative projects are not government led. On the contrary, it is individuals and small groups who produce the best stuff which corresponds to actual needs. Steve Now this is interesting. Totally agree that there's tons more collaboration among teachers interested in these innovations. This is a good thing. But it's your last comment, about the best projects not being Gov-led that strikes me as true. I've often blogged about this e.g. Millie the social networking teacher. If we could point support towards bottom-up activity, we might get somewhere. I agree with much of this. It's daft to think that classrooms are the best places to learn 'communication skills' - whatever they may be - or 'digital literacy'. And I too think big fat abstract concepts like 'creativity' are too grand(iose?) to really get a handle on. And yes, I'm sure there are many teachers who don't fully understand generic techniques of 'problem-solving'... There is also the psychological elephant in the room which is the problem of transfer - or rather lack of it... Evaluations of many thinking skills programmes find that students like them, but the skills don't last and they don't spread - unless you teach in a very particular way. David Perkins' book Making Learning Whole is very good on this. But the fact that some of this 'key skills' stuff is misconstrued or ill-thought-through doesn't mean it's a silly idea. If we get a bit more precise about what exactly it is that we think kids are going to need in the way of learning skills and attitudes - and then talk to them about it, to see if it makes sense to them - then I think we can make progress, and actually have some hope of escaping the obsession with tests and content. Now we're getting somewhere. I agree that the current 21st C Skills agenda is woolly and vague and I couldn't agree more with the idea of further refinement. My own view is that these skills, and their transfer (important point always completely ognored by educational theorists in this area), are best tackled outside of the classroom and schools, as schools are still essentially classroom delivery mechanisms. The current model of teachers in classrooms pretends it is (or can) deliver these skills, but in essence, it does not. There's one exception to this and that's sport. I honestly believe that team building and collaboration and social skills are taught on playing fields but this too has been neutered. My own view is that we need to get students much more actively involved with groups outside of school - in sports, business and community work. I have seen young people blossom on merely one week of work experience, when they really do sit in collaborative teams, and experience a mature mixed-age environment, and learn how to do things in a real context. A second approach, within schools, is not to see these abstract skills as a separate thing but to introduce vocational A-levels, that really do require these skills to be practiced. Until we get rid of the apartheid of academic/vocational (the latter always demoted) we will get nowhere and condemn and sacrifice the majority of our young people our students and our country to meaningless, vague so-called, 21st C abstractions. Thanks Guy - a much appreciated contribution. Well said Donald. I am determined to make the changes necessary in my school. I've been on this path for four years now and will keep going for the sake of the students. I 'm sure some of my teachers think I'm on a mission to nowhere but I have seen the positive developments in the students engagement etc when they re given some responsibility and choice in their learning. We have to teach how they best learn or schools as we know them will disappear fast. I would like to insert that the "21st Century Skill" I teach most, and tell students is most important, is the ability to determine the reliablity of information they find on the web. Students may use media for their own personal lives, but when asked to further their knowledge of any topic they often cannot determine authority or the author's credentials of info they find on the web. They don't know how to look at information on the Internet. Teaching young people how to search and check the reliability of information is fine. However, in my experience, few teachers know hos to use more than keyword searches on Google. I also find that young people are more savvy than one would imagine. It would be interesting to compare the skills of older people versus younger people on this one. My money's on youth! I just came across your blog today and was thrilled with this entry. I agree with so much of what you posted, and I'm particularly grateful that you are willing to take a critical look at educational systems and educators alike. Much of what you described exists in the community college where I work, i.e. teaching about social media while banning its use, instructors whose technology skills are miserably lacking asked to integrate technology into instruction, etc.